Here’s my third attempt at a world map, and my early attempts at adding some blur effects to the terrain. I was wondering if I could use one of your world maps for a game im makeing(#3). I would keep your copyright thing on it and would tell everyone who asked where i got the map from. Thank you for your time. Andy, sorry for the late reply – I’ve been away in Thailand without much computer access. As long as your game isn’t for resale, I’d be honored if you used my map! If you are planning on publishing it, please send me an email. 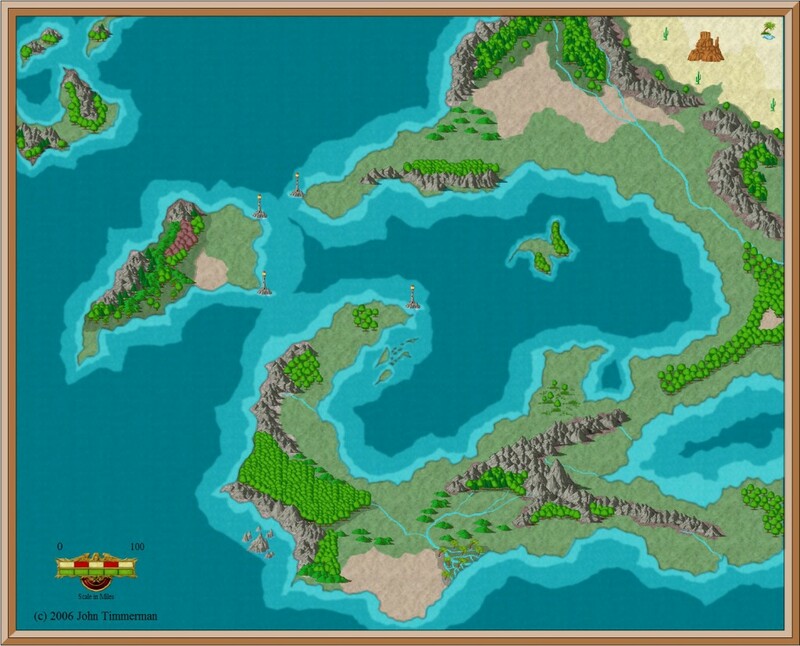 Hey, I was wondering if you would be cool with me using your map for a D&D campaign I was thinking of running? Yes, that would be fine. Any of my maps can be used for personal use – the terms can be found at http://creativecommons.org/licenses/by-nc-sa/3.0/. Do you mind if I use this map for a D&D game that im doing online? Hi Might. As noted in the preceding comment, you may use this map provided that it is not part of any paid product/service and you link back to this web site as attribution to the creator. Enjoy your game! Crap….I forgot to put the link back to this website…. How do you want me to do it? Hey, I love this map! I am using it for a D&D campaign and I think you do an awesome job! Keep up making these awesome maps please! Hi im Stephen Redgate. I am making up a human game. It i all about imagination like the D&D books. Anyways I was wondering if you could make a large map. I will give you more detail if you agree. I would be honored. @Stephen – unfortunately I’m not able to do any custom work at this time (the “real” job is keeping me quite busy!). You could try making your own map with cc3. Or, try participating in the profantasy forums and cartographer’s guild where you’ll find communities of avid mapmakers who could probably help you out. Hi, I was wondering if I could use this map for a Zelda original character club that I’m going to be hosting on Deviantart. It’ll be posted on the main page and will be for Role Play campaigns. And of course, credit and a link to this site will be given if this is used. Yes Katy, that would be fine. Sounds like fun. OK, so you make these using City Creator 3? Is it free? If not, do you know of any free map making software? This map has really interested me and I’d like to learn more about making it. Hi Shade, this map was made with Campaign Cartographer 3. It costs about US$50. Once you’ve purchased the base CC3 software, then you can get add-ons like City Designer and Dungeon Designer, which also cost money. If you’re looking for free, you could try Auto-Realm (I’ve never used it – it’s open-source and may not have all the pretty symbols like CC3, but worth checking out). Also, try Gimp, which is an open-source (free) program similar to PhotoShop – not as easy to get started, but definitely capable of making beautiful maps. Check out the Cartographer’s Guild Forums to find a good community of fantasy mappers using every type of map-making software available. The people there are friendly and glad to help new users get started in map-making. You can find me there under the user name loongtim. Hi john, im writing a fantasy novel and id like to know if you know any good map making programs out there for beginners that are free. thank you. There is a program called The Gimp, which is similar to PhotoShop. It’s not a mapping program per se, but can be used to make maps successfully. Check out the Catographer’s Guild forums to find tutorials for making maps with Gimp. Also, there is an open-source mapmaking program called AutoRealm, which can be found on SourceForge. I’m not sure how it compares to CC3, but it might be worth trying. Thanks Riku, I appreciate the compliment. I’m trying to find good map generators for the land of a book I’ve been writing, and it seems these are perfect for what I need. How do you make them, what program do you use, if any? I use Campaign Cartographer for the majority of maps on this site. @ Dante – Of course you can! All my maps here are free for personal use (creative commons by-nc-sa). I just ask that you link back to my website if you post the map on your website. hello john i’m a teenager who’s writing a fantasy book series that i want to get published one day and i was wandering if you could give me any tips on how to properly go about making a map for my world. i would be eternally grateful for your advice. It really depends on how you publish. If you’re goal is to get an agent and publish the book for mass consumption, then don’t worry about making a perfect map. Just sketch out your map for your own reference, because your publisher will hire a professional to make the final map for you anyway. Focus on what you do best – telling the story. If you plan to self-publish and you don’t have budget to pay a cartographer, then you’ll have to learn on your own. If you use CC3, then check out the forums on the Profantasy site for tips on map making. Also, regardless of what mapping software you use, check out cartographer’s guild – they have a very friendly forum where you can learn how to make maps (even using free software or by hand or whatever). There is also a place there to request people to make a map for you – some people might even do it for free. Keep one thing in mind – if you publish in print, your map will most likely need to be in black/white. But if it’s just going to be an ebook, then go all out with the colors! Thanks for all the info I really didn’t know all this. I will definitly use this to my advantage thanks once again. Your work is very inspiring. For the last two years I’ve been creating a small piece of a fantasy world that putting together for a D&D campaign. In the future I might use it to write a series of novels detailing the adventures of this ragged band heroes. As far as building the maps I’ve been using Photoshop. That process has been painful in its self. So thank you for the information about CC3 and the Cartographer’s Guild. Hi Classified. I make most of my maps (like the one above) with Campaign Cartographer. As far as free software goes, you can try The Gimp, which is similar to PhotoShop. The learning curve is a bit steep, but there are a lot of tutorials available – so if you have a lot of time on your hands, this would be a good choice. I’m not available for commissions at the moment, but you can probably find someone to help you out at the Cartographers’ Guild forums. There is a Mapmaking Requests thread where you can solicit help, either paid or free. i SO wish this programme was free! Thank you so much for the maps! I really appreciate being able to use them for D&D campaigns!